What is Blood Alcohol Poisoning? Alcohol poisoning happens when there is too much alcohol in the bloodstream. When a person continues to drink alcohol, the amount of alcohol eventually reaches levels that cause alcohol poisoning. However, there is no set number of alcoholic beverages that will cause alcohol poisoning in a person. For example, a 24-year-old male may have alcohol poisoning after 20 drinks in one hour but for another male the same age, it may take 30 drinks in one hour for alcohol poisoning to take place. Alcohol affects everyone differently and how quickly the alcohol absorbs into the person’s body depends on the following issues: the amount of alcohol drank, age, weight, gender, amount of food ate before drinking and ethnicity. In addition to absorption issues, a person’s liver has to filter out the alcohol because alcohol is considered to be a toxin. The liver can only filter out a small amount per hour. If alcohol is consumed very quickly, such as in binge drinking, the excessive amount of alcohol floats in the blood stream. When this happens, alcohol poisoning happens much quicker because the liver cannot filter out the alcohol fast enough. As the blood alcohol content increases in the bloodstream, the faster alcohol poisoning occurs in the body. As the blood alcohol content continues to increase, several changes in the body occur before the body reaches the alcohol poisoning level. The first changes seen usually cause mild impairment. These changes include the following symptoms: mild coordination, speech, memory, and balance impairments. 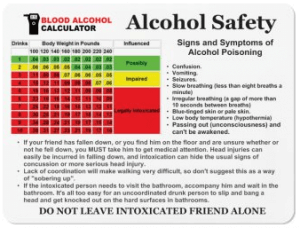 Blood alcohol content for this level is usually seen at 0.5 to 0.15%. The next level of blood alcohol content impairment usually occurs around 0.06-0.16%. At this level of intoxication, a person’s driving skills are impaired, and some people tend to become more aggressive which increases the risk of injury to themselves and others. Before reaching the life threatening level, impairment occurs with the blood alcohol content level at 0.16-0.30%. At this level, the person may experience the following impairments: loss of conscious, blackouts, and judgment and decision-making skills are dangerously impaired. Lastly, the life-threatening blood alcohol content levels occur at 0.31-0.45%. This level represents the beginning level of alcohol poisoning. When a person’s blood stream becomes saturated enough to cause alcohol poisoning, the person’s brain functions begin to shut down. The brain controls basic life-support functions such as temperature control, heart rate, and breathing. As these functions are affected, other symptoms such as vomiting, unconsciousness, seizures, clammy skin, trouble with breathing, slow heart rate, no gag reflex and hypothermia begin to take their toll on the body. 1. Breathing becomes irregular or stops. 2. Heartbeats become irregular or stop. 3. Hypoglycemia may develop and cause seizures. 4. Permanent brain damage or death may occur. What can you do about Blood Alcohol Poisoning? If you suspect a person has alcohol poisoning, you may want to consider calling 911 and getting medical help ASAP. Please don’t assume that an unconscious person can just sleep this medical condition off and be fine the next day. Medical assistance is critical for a person that has entered the alcohol poisoning level. Once the person has started receiving medical attention, you can take a step back and let the medical staff take control of the situation. The medical staff will monitor and evaluate the patent’s symptoms. Depending on the severity of symptoms, the patient may be given a breathing tube to help with breathing or and intravenous drip to help with dehydration. Sometimes, kidney dialysis is used because it will speed up the removal of toxins from the body. Some patients need a urinary catheter because they have become incontinent. Lastly, some patients need to have their stomach pumped because of the high levels of alcohol in their system. How to prevent Blood Alcohol Poisoning? The best way to avoid alcohol poisoning is to avoid drinking alcoholic beverages.